Also known as the EMPIRE 40 and a variant of the RHODES RELIANT 41, all from the same builder. The OFFSHORE/EMPIRE 40 was created in an effort to reduce costs of contruction and design royalties of the RHODES RELIANT. Although from the same basic tooling, the OFFSHORE 40 has iron instead of lead ballast, and differences in other construction details. Sold as a sloop or yawl. 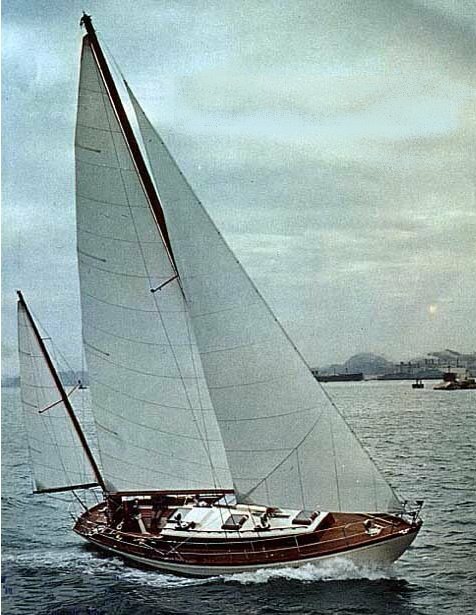 In the mid 1970's, Cheoy Lee Yard built another OFFSHORE 40 (variously designated as the OFFSHORE 4O MKII and then OFFSHORE 41), which was a different boat entirely and thought to be designed by Raymond Richards). See OFFSHORE 41. Also offered with a yawl rig. Photo from original Cheoy Lee literature.